Planting: Transplants from the nursery can be planted year round. Do stem cuttings in late winter. Height: 50 feet in warmer climates - usually under 10 feet in cooler climates. Spread: 5 to 20 feet. Final spacing: 15 to 20 feet or as close as 3’ in a hedge planting. 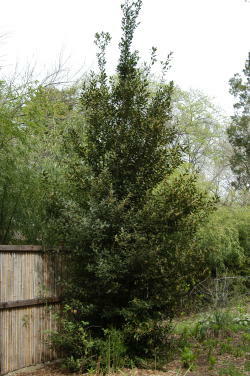 Habit: Tender, upright, evergreen shrub or small tree with small creamy flowers in late spring followed by shiny black berries. 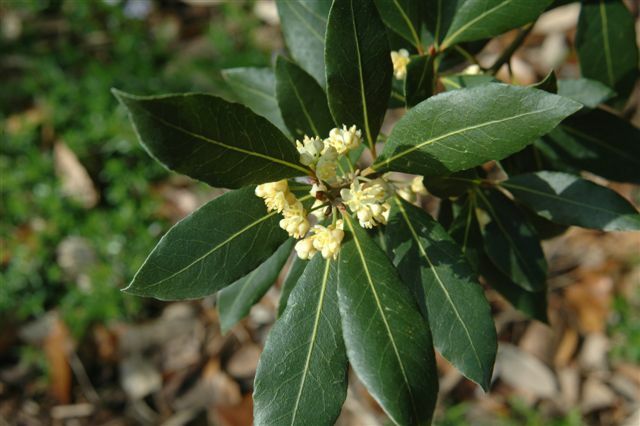 Bloom/Fruit: Small creamy light yellow flowers in early spring, followed by shiny black berries on mature trees. 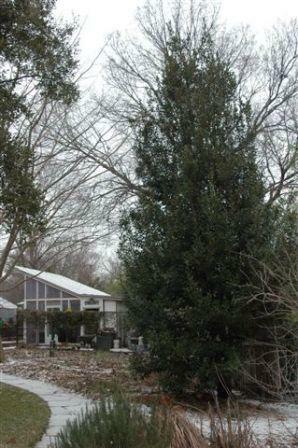 Growth Habits/Culture: Slow growing herb but will develop into a small tree or large shrub. Easy to grow in most any situation, but it prefers healthy, well-drained soil. 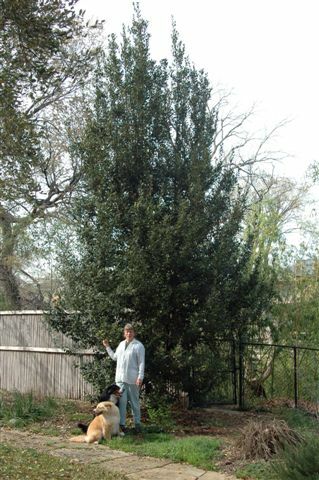 Mostly grown as a dwarfed, aromatic foliage plant. Best in full sun. Does well in pots or in beds. Hardy in most of zones 8-11. Harvest / Storage: Collect the evergreen leaves year round and use fresh or dried stored in glass. Dry leaves will lose their fragrance in time so best to use soon after drying. Culinary Uses: Flavoring for many foods and teas. Do not eat the leaves. They can cut into intestinal tissue. Bay is a wonderful herb for soups, stews and chilies, but it also makes a great ornamental plant. 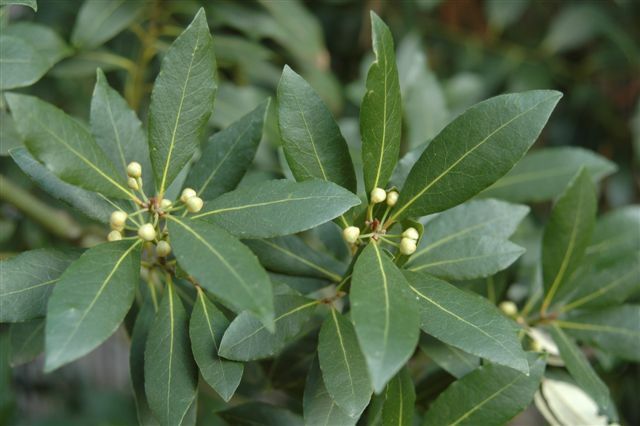 Medicinal Uses: Oil of bay is used for skin diseases and bruises. Tea is used to treat sprains and aching joints. It is said to be mildly narcotic, a digestive aid and appetite stimulant. Landscape Uses: Centerpiece, patio plant or container plant. Also can be use for hedge planting. Other Uses: The leaves repel moths when placed in shelves or storage containers and also used in potpourri or wreaths. Fruit oil is used in making soap. Cut foliage is good for indoor arrangements but not long lasting. Sweet myrtle is far better. Problems: Few other than freeze damage in severe winters if you live too far north. 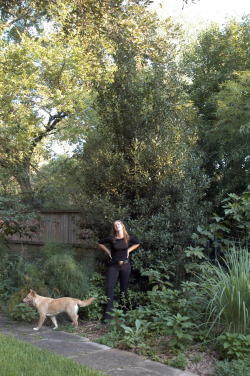 Notes: Mine has been outdoors for over 20 years and is over 30’ tall. The first several years it was in a pot outdoors. This is a great example of a plant's increased hardiness under an organic program. Logan, Hannah, and Big Bay.